A selection of my data visualization work. A real time cart abandonment UI, designed and developed in collaboration with the Adobe R&D team in order to demonstrate their real time analytics abilities. Each dot is a shopping baster and as users move closer to a purchase they animate from left to right on the screen, dissolving out when they exit or close the browser window. Marketers can specify who to target with promotional emails to get them to return and make a purchase. Analysis of how people use document cloud features in order for the design team to become more data driven. Design for a graph to understand how trail vs paid users use document cloud. This graph show what features are most commonly used before and after users use the new “send for signature” tool in document cloud. Another expression for how to visualize what features are used before and after “send for signature”. 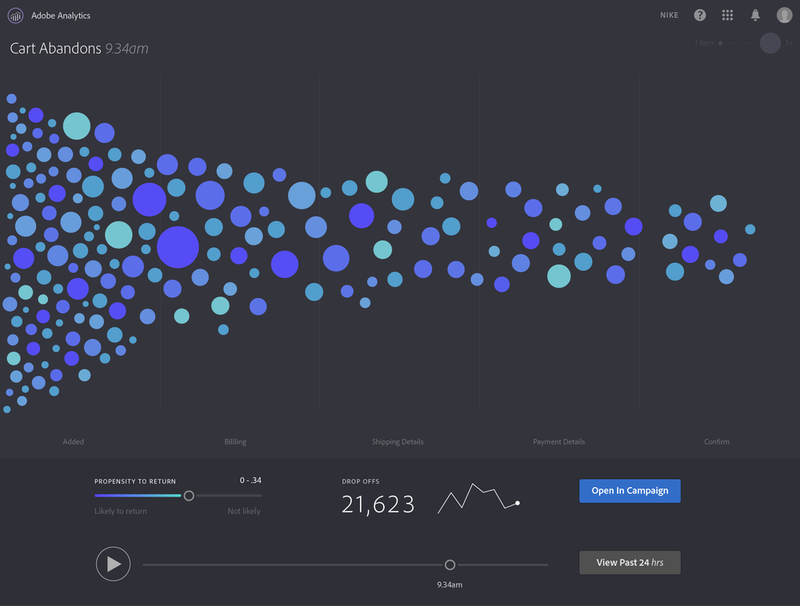 Visualization indicating how and where paid users come from. This visualization shows what features are used after every tool thats available inside Adobe’s Document Cloud. A sankey diagram showing how and where subscribers to Document Cloud come from. 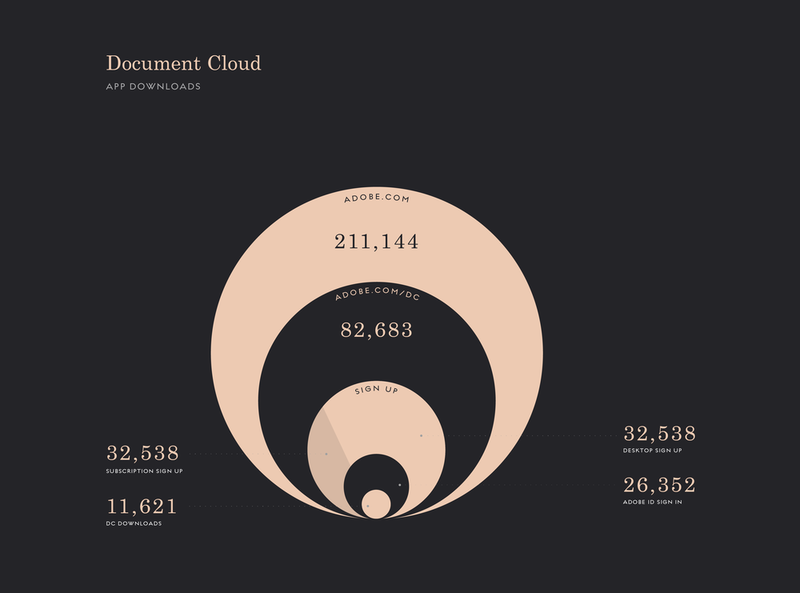 A visualization of each tool in document cloud, grouped by type (edit, share etc.) and the approximate amount of time users spend on each tool. A new way of visualizing a sankey diagram, each subsequent bar is broken up by the ratio of traffic coming from the previous type - and color coded to associate them. This visualization shows how each tool inside Document Cloud is accessed and the more common method of accessing each tool whether it be through clicking the tools button, from the drop down menubar, from search or using the keyboard shortcut.